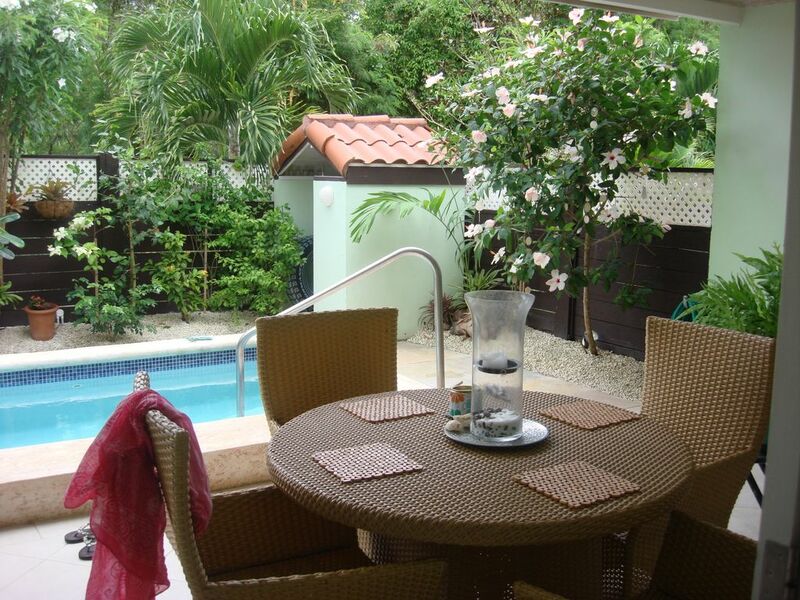 9 Porters Gate is an air conditioned town house on the beautiful West Coast of the island minutes from the beach. The spacious ground floor is open plan leading onto a tropical patio with it's own plunge pool. The modern kitchen is ideal for conjuring up those Caribbean culinary delights. Choose to eat at either the breakfast bar or at the dining table or maybe dine outside where you may spot a monkey on the fence or a humming bird hovering at the Hibiscus! Relax on comfortable sofas and maybe watch TV or listen to your favourite track on the blue tooth speaker. The master bedroom has a king sized bed, balcony, dressing room and en suite wet room. The second bedroom has twin beds (or zipped together to form a super king)balcony and en suite bathroom with a walk in shower and marble vanity unit. The tranquil secure development consists of 28 town houses, has a communal swimming pool and tennis court. Additional Services:: We aim to make your stay on the island as pleasurable and trouble free as possible. To this end our local representative will meet you at the house during your stay and introduce you to the property and it's features. We arrange a once weekly maid / cleaning service with fresh linen provided. Additional maids' visits can also be arranged along with taxi / car hire should the requirement be needed. A taxi can also be arranged to meet you at the airport if you do not wish to hire a car. Our local representative will discuss any requirements you may have when you arrive and will always be on hand to help with any queries or recommendations you may have. Any additional services you may wish to use will be charged for locally. The development does not provide any form of pool supervision and caution must be therefore taken at all times with younger children at both pool areas. A safe is provided along with a telephone (local calls are free but international calls are barred from this handset) WiFi is provided. Please note that electricity IS NOT included in the rental cost and is charged on a 'pay as you use' basis at £22.00 per 100 units used. Typical average use for a two week stay, using the air conditioning sensibly, is between 300 - 400 units.This system is in use to deter guests from leaving the air conditioning on all day with the windows wide open whilst relaxing at the beach!! Please note that the check out time on your day of departure is 12.00 noon. Barbados has near perfect weather, direct flights and old world charm. The townhouse at St James is perfectly positioned minutes from stunning beaches on the West Coast and the shopping amenities at nearby Holetown. Many water sports are available including snorkelling, scuba diving, sailing, water-skiing and four fabulous golf courses are in close proximity. Swim in warm crystal clear waters see the turtles or maybe chilll out at a local beach bar. The Lone Star Restaurant, the Ivy of the Caribbean, is two minutes by car and is a fabulous treat for lunch or dinner! Amenities such as banks, bars, supermarket, post-office, medical centre, cyber cafe and duty free shopping are all but a half a mile away. There are many beach front restaurants catering for all budgets lining the palm fringed shoreline. A stop at Second Street in Holetown is a must for those who wish to dance into the small hours.